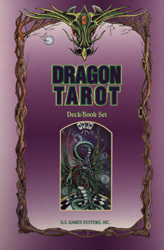 In 1995 Peter was commissioned to produce artwork for The Dragon Tarot by U.S. Games. 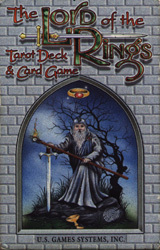 He teamed up with the London School of Tarot and the deck was released in 1996. This was Peter's first Tarot project and the challenge of producing so many images pushed him to the limit. However it was well received and continues to sell well in both Europe and the U.S.A.
"Ever since I first read The Hobbit and The Lord of the Rings, I had wanted to create a thesis about the esoteric meanings behind these great works. In 1990 I finally began work on it and found myself relating these meanings to the tarot. After much work I had a plan for a full tarot deck and card game based on the hidden meanings behind the people, places and events in The Lord of the Rings. I contacted the London School of Tarot and then Stuart Kaplan, the chairman of U.S. Games with the idea. After much dialogue he finally agreed to commission it and then it was over to Tolkien Enterprises to approve it. When permission was granted I began work and found that as I painted each card, the meanings behind them manifested into my life. It was a peculiar, powerful and wonderful journey. This also led me to meet the Tolkien family and it was such an honour to meet and talk with them. The deck was released in 1997 and I felt that it was my tribute to a man who had so influenced my life." The Ogham is an ancient Celtic alphabet used for magic, divination, secret communication and on memorial stones. Each letter represents a tree and has corresponding birds and colours. Because each tree has its own character and significance, it lends itself well for use as an oracle where one can cast the cards and interpret the meaning to comment on any issue. The Celts had great reverence for nature and the Druids were well known for their esoteric knowledge of trees. This knowledge lay hidden for centuries but was brought back into the public eye by Robert Graves in his book The White Goddess. 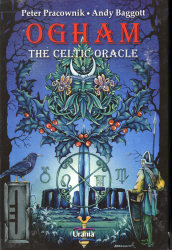 The Ogham Celtic Oracle was created as a system of divination for personal guidance and spiritual growth. Drawing on the ancient wisdom of the Celts, The oracle is designed to help spiritual seekers to find clarity and insight on their path of learning and to reconnect with the magic of the Celtic Forest .